Experience - Morrill & Fiedler, LLC. 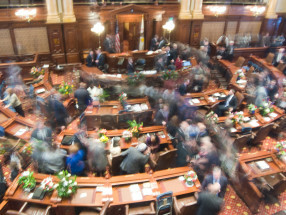 Our professionals know Illinois government first-hand, having served in both its legislative and executive branches, and having represented a wide range of clients including corporations, associations, partnerships, non-profits, governments and individuals. Our professionals have particular substantive expertise in many fields, including: utility regulation, insurance legislation, health care, land use and zoning, property taxation, pension system administration, transportation, professional regulation and municipal policy. We also have experience in the areas of government procurement and agency rulemaking. We bring substantial resources to our practice. Our Springfield office, located a block and a half from the state capitol, is staffed throughout the year. In Chicago, our offices are located minutes from the James R. Thompson Center and Michael Bilandic Building (the state executive and legislative offices). We have offices in both Chicago and Springfield, Illinois, with our Springfield office just blocks from the state capitol. In Chicago, we are housed within a 650-attorney law firm with offices in Chicago and Washington, D.C, among other cities, affording us with substantial resources and ready access to attorneys who concentrate in virtually every legal discipline. In addition to pursuing specific client objectives in our government relations work, we provide comprehensive monitoring of all bills, amendments, conference committee reports and resolutions introduced before the Illinois General Assembly. We also monitor all rulemaking efforts of state agencies, and review all major Illinois newspapers for articles pertaining to Illinois government. Government relations is a process expertise, much like courtroom advocacy. In both disciplines, understanding the dynamics of the process and institutions is key to success.